I’ve been promising details and banners for my blogathon on March 9 and 10, and I finally have both ready to share with you all! 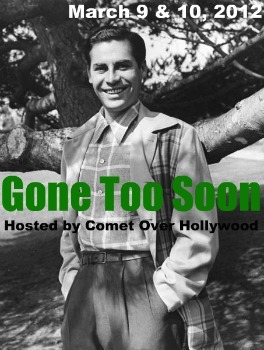 The theme is “Gone Too Soon”-spotlighting stars who died before the age of 50. Everyone can write up to three posts. To avoid repeated stars, as you know who you want to write about, comment below and I will add you to a list of topics on this page. Don’t know who you want to discuss yet? That’s okay, you have until March 9! Still let me know you are interested and post one of the below banners on your page (feel free to resize banners if they are too large). When it gets closer to time, I will let everyone know how we are going about posting. Hope everyone is excited as I am! This entry was posted in Star Deaths, Star Profile by Jnpickens. Bookmark the permalink. Yes! 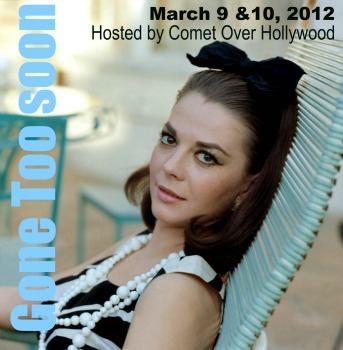 Count me in and I would love to write about Natalie Wood! I was thinking I might right about either Valentino or Judy Holliday. Oh my god. How could I forget about Judy Holliday! One of my favorites! My first thought was Jack Carson–but he died at 52. And Ronald Colman–he died at 56, I believe. So many greats died in their fifties! So count me in for him. Oh darn! Well I did consider going to age 55 or 60 for people like Ronald Colman or Vivien Leigh, but I didn’t want to get too too old so decided to stick with 50 as the cap. John Garfield is an excellent choice! I’d love to write about James Dean if he’s not taken! Hi Jessica, I’d love to do a post on Tyrone Power. I recently watched several of his movies and became a big fan. Thanks! Could you put me down for Dorothy Dell? Thanks! Ha, was just Tweeting at you! Yeah, I’ve wanted to dig into the books and newspaper files since the time I saw that. Really enjoyed her there, hopefully I have one of her other couple of movies on hand to view as well. Thanks! Hopping on board! I’d like to do a post on Steve Cochran. Thanks! That will be a great post! Thanks! I’d like to write about Thelma Todd! Damn! Never mind, Page grabbed her. How about Bobby Driscoll? Sorry about that, Brandie 😦 But Bobby Driscoll will be great. I’d love to learn more about him! May I write about John Gilbert? I’d like to write about Robert Williams–the guy from Platinum Blonde–at Classic Movies. I am so looking forward to reading about Robert Williams — he was SO outstanding in Platinum Blonde. Such a talent. Putting you on the list! I would like to participate. Put me down for Linda Darnell. Love her 🙂 So glad you picked her! This looks like a lot fun! 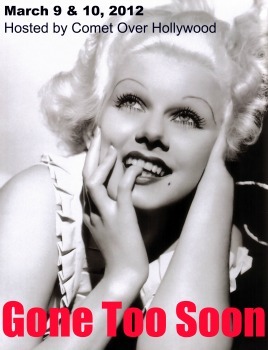 Could I take a stab at Jean Harlow? This is an inspired idea for a blogathon. Put me down for John Cazale (age 42). Yay I was hoping you would participate 🙂 Putting you down for him! I saw the banner on Monty’s All Good Things and decided to check things out. Does one have to be invited to participate? Or may I invite myself? I’d like to write about Montgomery Clift, who died at age 45. Thanks for dropping by Patti! Everyone is welcome, this is an open party 🙂 I’ll put you down for Montgomery Clift! Thanks for joining, it will be alot of fun. Hey Natalie, you sure can write about Errol 🙂 I guess I meant to say less than or equal too 50 hehe. I’ll put you down! Please put me down for Marilyn Monroe. Hi! This is a fabulous idea for a blogathon. If possible, I’d love to write about Olive Thomas, silent film star and Mary Pickford’s sister-in-law who died at age 24. I run the blog Critica Retro. Are you limiting to actors? Because when I think Gone Too Soon, Murnau is the first guy I think of. No limit, Murnau would be great! I forgot to specify. I look forward to the post and welcome! I would like to contribute a post about Sal Mineo. I remember when his death was announced on a local radio news cast and how shocked my mom was to hear of his death. I think he was in his 30s? Would a post about Sal Mineo be fine with you? Hey! I would like to join – and write about Laird Cregar. Hope that’s ok.. I never participated on such a blogathon before..
hehe.. I am very excited, too! 🙂 Laird Cregar is one of my favourites.. Can’t wait to read all those others fabulous posts.. So many participants – and so many great artists and fascinating personalities..
Glad that I can join this! John Garfield, the prince of films noir. I would love to, honor Mr. Garfield….sad ending to a brilliant man, died at aged 39. Blame Mame will be doing a post on Jayne Mansfield! Has anyone claimed Thelma Todd yet? I didn’t see one, but I came late to this party (ironically…) Kay http://www.moviestarmakeover.com Thanks, let me know! This sounds like a great blogathon. Would it be possible to do a piece on the mostly forgotten pre-code actress Helen Twelvetrees? She died at 49, so it is kind of close to the cutoff point, but I have always been fascinated with Twelvetrees and she actually died in my hometown and is buried just outside of town. Sorry I didn’t see this until now, Jessica, but I’d love to participate! Since my favorite actor Sal Mineo is already taken, I would love to contribute a post on Conrad Veidt, who died at age 50. 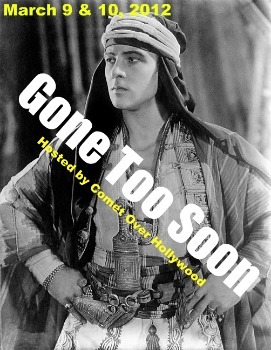 I did forget Colin Clive! Are you interested in writing about him? Is it too late for me to join in? I’d like to write an appreciation of Elvis. Nope! Just comment by 12 a.m. Sunday and I’ll make sure you are posted. Thanks for joining!